In this photo released by Rappler, CEO and Executive Editor Maria Ressa, second from left, is escorted by police after being arrested upon her arrival at Manila's International Airport on Friday. A well-known journalist critical of the Philippines government, who was arrested in February for libel, was arrested again on Friday. Maria Ressa has long been an outspoken critic of President Rodrigo Duterte, who has accused reporters of being "spies." Ressa says her arrest is reflective of a hostile atmosphere toward journalists in the Philippines, which has drawn condemnation from journalists around the world. Ressa was arrested at Manila airport shortly after she stepped off a plane from San Francisco, CNN reported. She was charged with an investment law violation after her media company, Rappler, was accused of violating the law by letting U.S.-based Omidyar Network invest in the company. The Philippines bans foreign investment of news media. 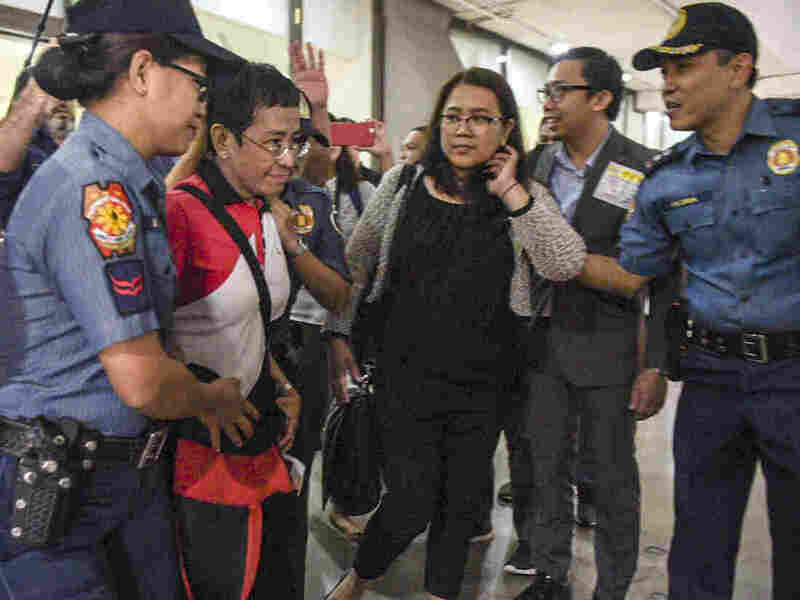 "It's sad that this is the kind of welcome our country gives a journalist," Ressa told reporters as she was released after posting bail hours later. "Sad day for me, and apparently the Philippine government isn't satisfied with arresting just me; the fact that they also included upstanding, successful tech and education entrepreneurs and businessmen? This is a bad signal to send to the rest of the world." Ressa says Omidyar has no say over the site's news operations, and argues that the government is targeting her because her site is critical of the administration. "The fact that the government continues to try to label us as criminals is itself criminal," Ressa said. "Every action takes us further on a descent to tyranny." Along with other journalists, Ressa was named as part of Time magazine's 2018 Person of the Year awards. "Ressa steers Rappler, an online news site she helped found, through a superstorm of the two most formidable forces in the information universe: social media and a populist President with authoritarian inclinations," Time wrote. "Rappler has chronicled the violent drug war and extrajudicial killings of President Rodrigo Duterte that have left some 12,000 people dead, according to a January estimate from Human Rights Watch." In February, Ressa was arrested and charged with cyber libel for linking a local businessman to illegal activities in a Rappler report published in 2012. "Not only was it published seven years ago, it was published months before the actual law we allegedly violated had even been enacted," Ressa told NPR's Scott Simon. "You can't have a retroactive application of a law that didn't even exist yet. So I used the term 'laughable' that night in detention. I came up with a new word. The word is 'travesty.' This is insane." As NPR has reported, Presidential spokesman Salvador Panelo told local media at the time that Ressa's arrest "has nothing to do with freedom of expression or freedom of the press." According to the BBC, Rappler has had 11 legal cases filed against it since January 2018. "All we can do right now is hold the government to account," Ressa told NPR. "I don't think this is about me or about Rappler. Press freedom is the foundation of the rights of all Filipinos to the truth."